As amudhanAr said that there is no equal to him, emperumAnAr looks at him and says – if you get interested in some matter other than me, or if I liked some matter other than you, then your happiness would not be long lasting. amudhanAr replies – for my lowliness, your kindness is there, and, for your kindness, my lowliness is there; so what reason would be there for us to unnecessarily leave each other?. 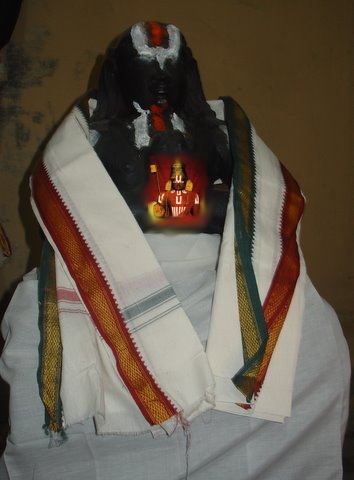 As amudhanAr said that emperumAnAr entered his mind and is present day and night, and there is no equal to himself, emperumAnAr looks at him and says – if you leave me and wish for something else over time, and if I leave you and support some other matter, then this happiness would not last long isn’t it? amudhanAr replies – for my lowliness, your kindness is there, and, for your kindness, my lowliness is there as the only shelter; so what reason would be there for us to unnecessarily leave each other and become engaged with some other matter? pazhudhE agalum – in unnecessarily leaving (each other). That is, there is no reason to leave. pugal onRum illai – there is no other shelter (for my lowness). That is, there is no shelter other than your kindness which considers such lowliness itself as the offering to accept. Like vEdhAnthAchAryar said in ‘aparAdha gaNai: apUrNa kukshi: kamalAkAntha dhayE katham bhavithree’ (When I am here who has done innumerable sins among the sinners, you are avoiding me and looking for those who have done fewer sins, and so your stomach would not be fed well, so I wonder what would happen to you Oh the kind one who is the wife of the lover of kamalA! ), one goes around on the look out for complete mistakes to do to satiate his hunger (for committing such mistakes), and where sarvESvaran corrected kAkAsuran who was a worst sinner, and where He said ‘yadhivA rAvaNassvayam [SrI rAmAyaNam]’ (even if one who has come is rAvaNan (bring him to me if he is here to surrender/to become a friend)), it is done such that if He protects the sinners then that would fit His glorious esteem, and since the sins of devotees are target of kindness of the lord, it is apt for amudhanAr to say that for his lowliness there is no shelter other than emperumAnAr’s kindness. arutkum ahdhE pugal – For the quality of kindness of your highness, my bad ways only would be the target. Since there is no use of the quality of kindness when applied to those who do not have any blemishes/sins, and since only those who are having blemishes can be the target of it, and since there is no sinner equal to me, it is only my lowliness is the shelter for your kindness. and as vEdhAnthAchAryar said in ‘mayithistathi dhushkruthAm pradhAnE mitha dhOshAnitharAn vichinvathee thvam | aparAdha ghaNairapUrNa kukshi: kamalAkAnthadhayE! katham bhavithree ||’ (I being the lowly target for saving; I am the complete target, for you I was available and you were able to attain the unattainable (me)); and ‘aparAdha chakravarthee’, and ‘pApAnAm prathamOsmyaham’, (I am the foremost of sins), that I being the full target of your kindness, I was obtained for you, like how one wishes to obtain something which is most difficult to obtain. labhdhOhi -> It is well known that if someone drowns in a sea then within a few hours sea would leave the body in its shore; In this material world, I was immersed, and was like ‘asannEva’ (~ like non-existent), for a long time, and you made me something significant (made me understand my true nature), and you brought me to the shore. nammAzhvAr too said, ‘andho adiyEn una pAdham agalakillEn iRaiyumE [thiruvAimozhi – 6.10.9]’ (I cannot be separated from your divine feet even for a second), and ‘pugal onRillA adiyEn un adikkeezh amarndhu pugundhEnE [thiruvAimozhi – 6.10.10]’ (I who does not have any other shelter has surrendered under your divine feet and am well settled there). ilOr – (those not having the aforementioned blemishes) – this cannot be about those in this world who have vowed to be tied to material relations; and even though mukthas reached the shore (paramapadham) as said in ‘karai kaNdOr’, and are immersed in the qualities of emperumAn after living in this world and were tied in to this material world for some time, since this word (ilOr) is saying it in absolute terms, it cannot be about mukthas either; now, as said in ‘parisEshAth’, and ‘yathra pUrvE sAdhyAs santhi dhEvA:’ (they worship emperumAn eternally), and ‘thathviprAsO vipanyavO jAgurvaham sassamindhathE’ (the nithyasUris who are always awake and worshiping Him), ilOr is about nithyasUris who do not have any touch of this material world. ini nAm pazhudhE agalum poruL en – for us who have understood the above, what would be the reason for us to unnecessarily leave each other in the future? nAm -> us -> himself and emperumAnAr; Or, since it is sound of multi-plural, it implies nAm -> us -> emperumAnAr and all those related to him and those related to them and so on, every one of them (All, together with emperumAnAr). nAm pazhudhE agalum poruL en – As said in ‘poruL allAdha ennaip poruL Akki adimai koNdAy [thiruvAimozhi – 5.7.3] (You took me as your servant and made me create thiruvAimozhi, I who was a nothing, You made me understand my true nature), and in ‘ennaith thee manam keduththAy [thiruvAimozhi – 2.7.8]’ (You made me have the mind that does not have anything bad), ‘maruvith thozhum manamE thandhAy [thiruvAimozhi – 2.7.7]’ (You gave me the mind that would focus and do services to You), ‘aRiyAdhana aRiviththa aththA nee seydhana adiyEn aRiyEnE [thiruvAimozhi – 2.3.2]’ (You helped me as an AchAryan, and I cannot measure the level of your help), (so) instead of being thankful to you, is there is any purpose for us in moving away from you? As maNavALa mAmunigaL said in ‘pAvaththAl yAn piRappEnElum ini endhai ethirAsan thAn piRakkum ennai uyppadhA [Arththi prabandham – 9]’ (~ even if I am born again due to my karma, my lord emperumAnAr would also be born at each such time to save me), since moving away would be lowly for you, and since you are taking us up like attaining the unattainable, other than accepting us as your shadow and keeping under your feet, other than keeping us to be dedicated only for you, is there any benefit in your leaving us – is what is conveyed here. rAman saying that he would accept even if it was rAvaNan (instead of vibhIshaNan who had come to surrender), shows the greatness of His kindness; seethA pirAtti who forgave and saved the servant women of rAvaNan– Her kindness is even greater. Unlike the lowly ones like rAvaNan, I who do not have any one equal in lowliness was accepted by you – so the greatness of your kindness is the best. So there is equivalence in my being the greatest in my sins and your being the greatest in your kindness; so why can’t these two be together? This entry was posted in iyaRpA, rAmAnusa nURRanthAdhi and tagged amudhanar, nurrandhadhi, nutrandhadhi, ramanujar, ramanusa on August 27, 2016 by raghuram.